Desire for Quick Money: Blogging is one of the business ventures that don't yield money quickly. It is a long-term business. It hardly meets immediate financial needs. New bloggers who need quick money often get discouraged at the nursery stage of their blogs once they find out that money is not forthcoming. The truth is that the time and resources invested in blogs at the early stage is more or less like casting pearls before the swine. It is therefore advisable not to start a blog to meet pressing financial needs; instead, get a real job. Lack of Content Idea: In blogging, content they say, is the king. Blogs without rich, original and unique content cannot do well. Search Engines are friendly to content-rich blogs. Search Engines needless to say is the generator of organic traffics which are adjudged the best and the healthiest web traffic . Whenever a blogger is blank about what to write in order to engage his or her audience, the death knell of the blog will sound. Poor Choice of Blog Niches: Novices in blog business, who need quick cash out of blog often are clever to search, find and set up blogs in niches with high paying keywords. Even with little knowledge on the high-paying niches, they dabble into it. The consequence of such ill-informed decisions is the possibility of running out of content idea. When this happens, the passion for blogging and the blog will die. In setting up a blog, your passion should suggest your niche. Dwindling Traffic: Bloggers are generally encouraged when their blog’s traffic increases and vice versa. Poor Search Engine Optimization, poor or copied content could lead to dwindling traffic to a blog. The blogger along the line gets discouraged and gives up on blogging and the blog will die. Generally, the beauty of blogging is the number of eyeballs that sweep through the contents on your blog. Failure to Renew a TLD after Expiration: Top level domain (TLD) names are not free. They are paid for. Prices vary across host companies. TLDs are renewed upon the expiration of the registered validity period. 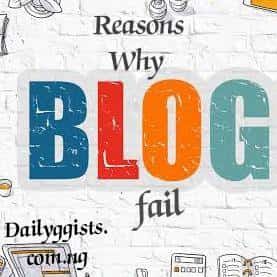 If a blogger fails to renew, the host company could take down the website and the blog will die. Denial of Adsense Approval: Adsense is still the easiest method of monetizing a blog. Majority of websites on internet use it even where the publisher is treated as a third party in the business. It largely saves publishers the stress of soliciting for adverts directly in which the publisher pockets 100% rent of ad spaces on his blog. Google Adsense approval nowadays is no little task. There are several strict conditions that a publisher must implement before being ordained an Adsense Publisher. Many a blogger give up blogging when they are denied Adsense approval. Lack of Resources: Blogging is not a free venture. It requires resources such as energy and internet access. Lack of resources has caused the death of many blogs. The blogger could have skill and passion for blogging but lack the resources to invest into the business.